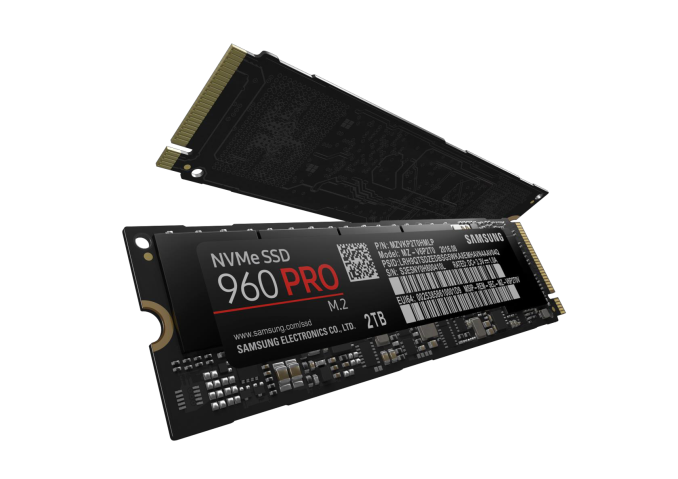 A year ago, Samsung brought their PCIe SSD technology to the retail market in the form of the Samsung 950 Pro, an NVMe M.2 SSD with Samsung's 3D V-NAND flash memory. The 950 Pro didn't appear out of nowhere—Samsung had shipped two generations of M.2 PCIe SSDs to OEMs, but before the 950 Pro they hadn't targeted consumers directly. ... looking at the performance specifications of the 960 Pro, it clearly is much more than just a refresh. Part of this is due to the fact that PCIe SSDs simply have more room to advance than SATA SSDs, so it's possible for Samsung to add 1GB/s to the sequential read speed and to triple the random write speed. But to bring about those improvements and stay at the top of a market segment that is seeing new competition every month, Samsung has had to make significant changes to almost every aspect of the hardware. We've already analyzed Samsung's 48-layer V-NAND in reviewing the 4TB 850 EVO it first premiered in. The Samsung 960 Pro uses the 256Gb MLC variant, which allows for a single 16-die package to contain 512GB of NAND, twice what was possible for the 950 Pro. Samsung has managed another doubling of drive capacity by squeezing four NAND packages on to a single side of the M.2 2280 card. Doing this while keeping to that single-sided design required freeing up the space taken by the DRAM, which is now stacked on top of the controller in a package-on-package configuration. Samsung's Polaris controller is also a major change from the UBX controller used in the 950 Pro. Meeting the much higher performance targets of the 960 Pro with the UBX controller architecture would have required significantly higher clock speeds that the drive's power budget wouldn't allow for. Instead, the Polaris controller widens from three ARM cores to five, and now dedicates one core for communication with the host system. The small size of the M.2 form factor combined with the higher power required to perform at the level expected of a PCIe 3.0 x4 SSD means that heat is a serious concern for M.2 PCIe SSDs. 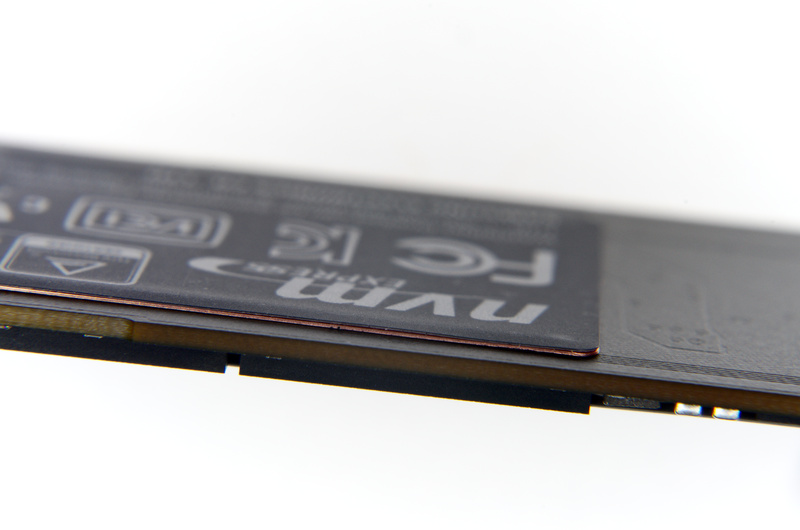 In general, these SSDs can be forced to throttle themselves rather than overheat when subjected by intensive benchmarks and stress tests, but at the same time most drives avoid thermal throttling during typical real-world use. Most heavy workloads are bursty, especially at 2GB/sec. Even so, many users would prefer the benefits of reliable sustained performance offered by a well-cooled PCIe SSD, and almost every M.2 PCIe SSD is now doing something to address thermal concerns. Toshiba's OCZ RD400 is available with an optional PCIe x4 to M.2 add-in card that puts a thermal pad directly behind the SSD controller. Silicon Motion's SM2260 controller integrates a thin copper heatspreader on the top of the controller package. Plextor's M8Pe is available with a whole-drive heatspreader. Samsung has decided to put a few layers of copper into the label stuck on the back side of the 960 Pro. This is thin enough to not have any impact on the drive's mechanical compatibility with systems that require a single-sided drive, but the heatspreader-label does make a significant improvement in the thermal behavior of the 960 Pro, according to Samsung. The warranty on the 960 Pro is five years, the same as for the 950 Pro but half of what is offered with the 850 Pro. When the 950 Pro was introduced, Samsung explained that the decreased warranty period on a higher-end product was due to NVMe and PCIe SSDs being a less mature technology than SATA SSDs. Despite having a very successful year with the 950 Pro, Samsung isn't bumping the warranty period back up to 10 years, and I would be surprised if they ever release a consumer SSD with such a long warranty period again. Going hand in hand with the warranty period is the write endurance rating. The 512GB and 1TB models have endurance ratings that are equivalent to the drive writes per day offered by the 950 Pro. The 2TB 960 Pro's endurance rating falls short at 1200TB instead of the 1600TB that would be double the rating on the 1TB 960 Pro. When asked about this discrepancy during the Q&A session at Samsung's SSD Global Summit where the 960 Pro was announced, Samsung dodged the question and did not offer a satisfactory explanation. The one other area where the 960 Pro does not promise significant progress is price. Despite switching to denser NAND, the MSRP of the 512GB 960 Pro is only slightly lower than the MSRP the 512GB 950 Pro launched with, and slightly higher than the current retail price of the 950 Pro. The 960 Pro is using more advanced packaging for the controller and NAND and the controller itself likely costs a bit more, but the bigger factor keeping the price up is probably the dearth of serious competition. When the Samsung 950 Pro launched, its main competition in the PCIe space was the Intel SSD 750, a derivative of their enterprise PCIe SSD line equipped with consumer-oriented firmware. It's big and power hungry, but brought NVMe to the consumer market and set quite a few performance records in the process. The 950 Pro couldn't beat the SSD 750 in every test, but it comes out ahead where it matters most for everyday client workloads. Since then, new NVMe controllers have arrived from Marvell, Silicon Motion and Phison. We reviewed the OCZ RD400 and found it was able to beat the 950 Pro in several tests, especially when considering the 1TB RD400 against the largest 950 Pro that is only 512GB. We will be comparing the 2TB Samsung 960 Pro against its predecessor and these competing high-end PCIe SSDs, as well as three 2TB-class SATA SSDs.